The Minaret and Archaeological Remains of Jam represent the artistic creativity and mastery of structural engineering of the Ghurid civilization (1000-1220). Jam is probably located at the site of the Ghurid dynasty's summer capital, Firuzkuh. The 12th and 13th century Ghurids controlled not only Afghanistan, but also parts of eastern Iran, Northern India and parts of Pakistan. The 65 metre high minaret, surrounded by mountains that reach up to 2400 meters, is built entirely of baked bricks. It is famous for its intricate brick, stucco and glazed tile decoration, which consists of alternating bands of kufic and naskhi calligraphy, geometric patterns, and verses from the Qur'an. 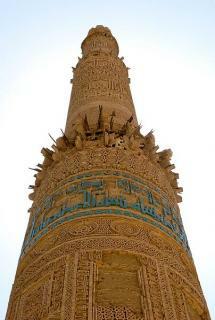 The Minaret was forgotten by the outside world until rediscovered in 1886 by Sir Thomas Holdich. Double Helix: "containing a double helix stairway"